The Red Sea is characterised by a unique composition of species of fishes which, based on unpublished data of the present authors, currently consists of 1166 species from 159 families whose habitats range from shallow waters to the deep sea. There is a total of 1120 species in coastal waters of the Red Sea recorded within an overall depth range 0–200 m; among them, 165 species are exclusively endemics to the Red Sea, whilst another 51 species are restricted to the Red Sea and Gulf of Aden only, and 22 species living at depths greater than 200 m are endemic. As the westernmost peripheral area of the Indo-West Pacific region, the Red Sea is at the opposite end of the distributions of many widespread coral reef organisms that range to the easternmost regions, such as the Hawaiian Islands, Easter Island, and the Marquesas Islands. It is noted that these areas exhibit high percentages of endemism among coastal fishes. The Hawaiian archipelago has 30.7% of its fishes as endemic species; Easter Island has 21.7%, the Red Sea 14.7% (19.3% when combined with the Gulf of Aden), and the Marquesas Islands have 13.7% endemic fishes. The Red Sea is 2250 km in length and it is very deep, with an average depth of 490 m, and a maximum depth of 3040 m. As expected, the fish fauna is far from homogeneous. The most divergent sector is the Gulf of Aqaba. We have noted that its entrance to the rest of the Red Sea is shallow. It has a maximum width of only 24 km, but a maximum depth of 1850 m. The shore drops off quickly to deep water. The prevailing cross wind creates upwelling, resulting in surface sea temperature at least as low as 21 ℃. Twenty-two of 46 species of Red Sea fishes living at depths greater than 200 m in the Red Sea are endemic (48% endemism). The Gulf of Aqaba has 22 endemic coastal species of fishes and eight endemic deep-dwelling species. By contrast, the neighboring Gulf of Suez, with extensive sand flats and a maximum depth of 70 m, has only seven endemic species of fishes. Of the 165 endemic Red Sea species of fishes, only two are elasmobranchs. Twenty-three families of Red Sea fishes have more than 20% of endemic species with the highest rates of endemism occurring among the Pseudochromidae, Schindleriidae (83.3% and 100% respectively) and the family Gobiidae with the greatest number of endemic species (36 of 139 recorded species). 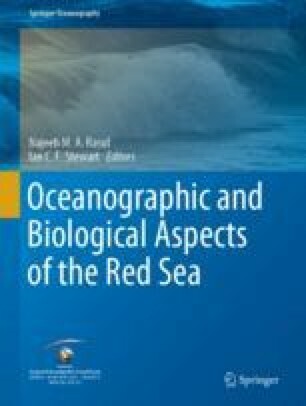 A brief summary of the history of scientific research on Red Sea fishes is provided together with complete lists of endemic species for (i) the entire Red Sea (separately for coastal and deep-dwelling fishes); (ii) the Red Sea combined with the Gulf of Aden; (iii) the Gulf of Aqaba and the Gulf of Suez; and (iv) Lessepsian migrants. Ongoing research is likely to reveal additional endemic species in the region. The scientific research cooperation between King Abdulaziz University (KAU), Faculty of Marine Sciences (FMS), Jeddah, Saudi Arabia, and the Senckenberg Research Institute (SRI), Frankfurt, Germany, in the framework of the Red Sea Biodiversity Project, allowed the first author to collect the Red Sea material and take numerous photographs. The first author acknowledges, with thanks, KAU and SRI for technical and financial support as well as Ali Al-Aidaroos, Mohsen Al Sofiyani, Ahmad Mal, Mohamed Gabr (KAU), Tilman J. Alpermann and Fareed Krupp (SRI) for their help in the realization of numerous studies on the Red Sea fishes. He also thanks Tatyana Malkerova (Russia) and Mohamed Abu El-Regal (Egypt) for their help in organizing trips to Dahab and Suez, respectively, and Ewald Lieske (Germany) for help in organizing a trip to Lahami Bay. The final presentation of this manuscript involved considerable Internet facilitated liaison across different time zones, between Russia, Ireland, Saudi Arabia, Canada and Hawaii. The authors are pleased to acknowledge the practical assistance of Dr. Peter Vine in management of this process and for both his editorial and technical contributions to this chapter.